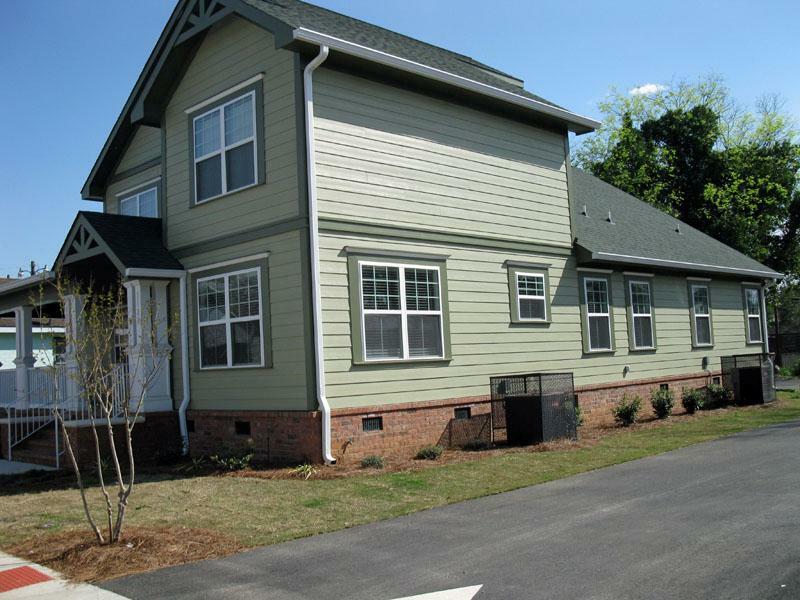 Within the last three years the Housing Department of the City of Augusta has contracted for the construction of multiple new housing units throughout the city, most prominently in the Laney-Walker Community. Questions in the community, city, and area abound. Are taxpayer funds being used wisely? Are the funds being disbursed according to governing regulations? How do costs compare with similar new homes in the city or in Columbia County? As background, it is noted that Dee Mathis has exhibited keen interests in the real estate developments and revitalization efforts in the Laney-Walker neighborhood, having previously appeared before the city commission in opposition to the Laney-Walker overlay zoning ordinance. The housing constructed was a duplex of two stories built by designated Laney Walker contractor J&B Construction and Services, Inc. The contract for it was dated June 22, 2010 and it was completed before, October 2011, when the final payment was made by the City of Augusta. J&B Construction is a designated Development Partner for the City’s Laney Walker Bethlehem improvement district.There are other development partners who have similar contracts and this review is not intended to single out this contractor but to address the City’s performance in administering similar contracts. Article V, Section H, states “Unexpended funds shall be retained by Augusta.” This supports the nature of the contract as being cost reimbursable because had the contract been a Lump Sum, the full contract price payment would have precluded the existence of any unexpended funds. In response to Ms. Mathis’ Georgia Open Records Request Act inquiry, The Augusta Housing Department provided no billing support that evidenced that the billed costs were actual costs as defined by check stubs, check registers, paid vendor and subcontractor invoices, or payroll registers for contractor employee-performed work. When this writer contacted Mr. Shawn Edwards, Neighborhood Stabilization Program Manager for the City of Augusta to inquire about the required billing support, he initially indicated that the City was only getting the reimbursement form from the contractor and was making payments based upon the agreed-upon contract price, contending that the contract price was the proper basis for payment, not reimbursable costs. A follow up request is in process for Augusta to provide the actual cost back-up it might possess. This report will be updated if contradictory data is provided. **The Federal Department of Housing and Urban Development has already cited Augusta for deficiencies like those in evidence for 1120 Florence Street. James D. McKay, Regional Inspector General for Audit, Atlanta Region, issued an audit report in 2010 which included the following: During the review, we identified two concerns regarding internal controls and entering obligations before contracts were fully executed. The City did not have internal controls in place to perform continuous and routine monitoring of its obligation process to ensure that its obligations were processed as intended and were valid. We discussed this matter with the City during the review, and the City agreed to develop monitoring procedures. The City entered its NSP1 obligations into the DRGR database in June 2010 for its LH25 set-aside activities. At that time, the obligations were not valid because the contracts for those obligations had not been signed by all parties. However, the City obtained the required signatures and fully executed the contracts in August 2010, ahead of the September 5, 2010, deadline. We discussed this matter with the City, and it agreed that its obligations were not valid until the contracts were fully signed and executed by all parties. 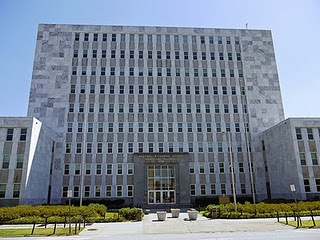 The failure to secure evidence of reimbursable costs, while paying out contracts based upon the maximum price, would appear to be a 1120 Florence Street manifestation of the first exception that HUD noted. The Office of Management and Budget circulars governing the NSP1 funds include the following. There are indications that the reimbursable cost could be materially less than the maximum price in the estimate and adjusted contract price. The contract pricing detail on page 4 shows a charge for a central air system with a 15 Standard Energy Efficiency Rating (SEER). **(View NTE Estimate Document Here) The unit installed was observed to be a Nutone Model NT4BD.This model is shown by the manufacturer as a 13 SEER Heat pump, capable of reaching a 14 SEER if paired with a variable speed air handler. The cost differential between a 13 SEER and 15 SEER is significant, because of the rigorous ductwork, blower, and air handler upgrades to achieve the higher rating. Having the HVAC contractor invoice, as required by this contract, and inspection of the installed system would settle this question. The paid-out contract price included a line item entitled “Administration.” In the absence of clarification, “Administration” would be an indirect cost which would be covered by the 15% Overhead and Profit allocation against all of the direct cost in the estimate, meaning that inclusion as a marked-up direct cost overstates “costs.” The overage would be $13,800, according to page 2 of the price estimate. **(See NTE Price Estimate Document Here) This single factor would be 5% of the total contract value. The contract estimate shows the “cost” per square foot on page 6 to be $79.73 **(See NTE Estimate Document Here), exclusive of land costs. Review of the real estate transfer shows the lot to have cost Augusta $12,000, taking the total square foot “cost” to $83.24. By comparison the sales prices of new homes in Grovetown, which include the developers overhead and profit on top of construction costs, are in the $76 to $82 range. This would indicate as much as 10% savings could be had by complying with the reimbursable cost standards of Augusta’s contracts. KEY QUESTIONS – Since there are dozens of similar Augusta contracts within the Laney Walker Bethlehem development project, wouldn’t the savings from enforcing the contracts as written save between 5% and 10% of construction costs? Wouldn’t the cost savings justify obtaining comprehensive, detailed costs? Based upon the $37,500,000 committed by the city to these developments the savings would range from $1,875,000 to $3,750,000. Isn’t Augusta in danger of having to repay $100,000’s of thousands of dollars, if HUD finds the city out of compliance with its payment of the Neighborhood Stabilization Program contracts? If Augusta’s contractor’s can save money by changing suppliers and methods, isn’t it worthwhile to help them do so under the cost reimbursable contracts? 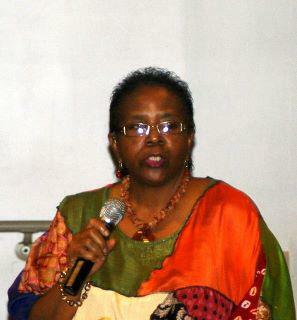 Dee Mathis and this writer were placed on the agenda of the November 15, 2011 meeting of the Augusta Richmond County Commission to speak in opposition of the Laney Walker Overlay Zoning District. After our impassioned presentations, the motion to pass the overlay failed 4-6 and a motion to postpone to the January meeting carried 8-2. Below are videos of Al Gray and Dee Mathis Speaking at the Nov 8th commission. Earlier this week, a decision was reached by Augusta Richmond County to resubmit, re-notify, and re-hear the application for the much smaller W-4 Foundry Overlay, which the applicant for the overlay, APD Urban Planning and Management LLC, asserts was the intent of the failed attempt to pass an overlay. We also cited a direct email response from Lois Schmidt (see at the end of this article) to Ms. Mathis’ inquiry after the application passed the Planning and Zoning Board on November 8. This response was labeled “Information provided to Ms. Mathis 10.8.2011” This also showed the larger Laney Walker map. Therefore it was our contention that the application was improperly changed inside of the 30 day notification period, which rendered the notification given invalid and incorrect. Not previously addressed to date is that the W4 Foundry node itself seems to have changed in configuration. Yesterday, December 6, 2011, Ms Mathis and I were subjected to a very one sided “report”“ in the Augusta Chronicle in which P&Z continues to insist that this application was handled correctly throughout, suggesting that Ms Mathis and I are property rights zealots whose unreasonable demands must be mollified, lest ARC suffer costly litigation. Neither of us were interviewed for the story. We believe that we fully documented that the Application was for the greater Laney Walker Overlay District and that the Application changed in midstream to the smaller W4 Foundry Node. We believe for the ARC Commission to have passed the “Laney Walker Overlay,” as it appeared on their agenda, instead of the “W4 Foundry Node Overlay”, would have been a grand mistake. Wiser heads saw this evidence and prevailed, hence the decision to do the Foundry Node Overlay over and pass it in February. Now we have presented it to the public. 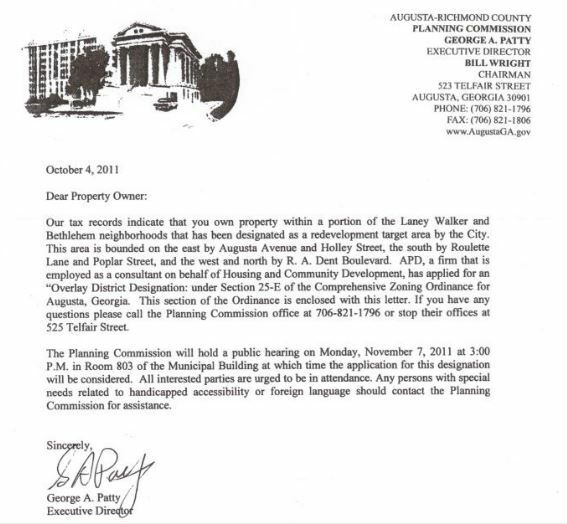 We also hope Augusta and APD very quickly notify all of the Laney Walker residents and hold meetings with them, now that their future plans have been revealed. Don’t try to set the Augusta Chronicle straight by posting this article. Links to the new kid CityStink.net are prohibited by the South’s Oldest News Paper. We congratulate CityStink.net for providing an outlet that presents the whole story, complete with links to source documents. We congratulate Augusta Today’s team for videoing events that the rest of the Augusta media missed. The Mislayed Overlay might just LAY the foundation for a new age of reporting in Augusta and the surrounding area. In the new media age, the people can see the evidence and judge for themselves. Dee Mathis and her allies reigned victorious after the Nov 15th Augusta commission meeting in halting approval of a proposed overlay zoning district for the Laney-Walker/Bethlehem neighborhood. You can read more about the background over this here: Commission Set to Vote Today on Overlay Zone. Bringing a flock of supporters, Dee Mathis was joined by veteran property rights advocate, Al Gray, in making oral presentations before the commissioners as to why they should deny approving the application for the overlay zone as submitted by the developer. In the end a majority of commissioners, in a 4-6 vote, sided with Ms Mathis and Mr Gray and denied the application. A second motion was approved that would have the commission revisit the overlay proposal at the first scheduled commission meeting in January 2012. You can watch videos of the proceedings at the commission meeting below. 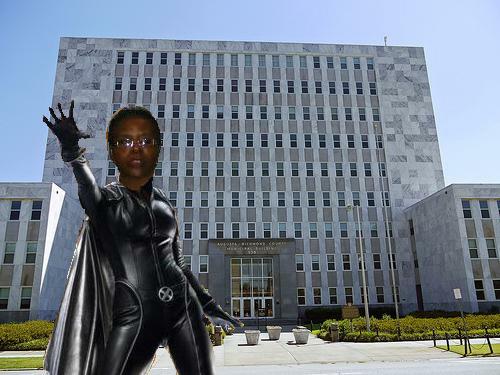 Will Dee Mathis and her allies be able to stop the Overlay Zoning District? Today is the day when Augusta commissioners will vote to either approve or halt a controversial proposed overlay zoning district for the Laney-Walker/Bethlehem neighborhoods in inner city Augusta. CityStink.net was the first in the media to tell you about the concerns over the overlay zoning proposal on October 6th in Urban Redevelopment or Land Grab? Laney-Walker homeowner Dee Mathis got wind that the Augusta Planning and Zoning Department was planning to quietly approve an Overlay Zoning District for her neighborhood on October 3rd. Ms Mathis nor any of her neighbors had previously heard about this proposal and none of them were notified prior to the Oct 3rd meeting. Ms Mathis and property rights activist Mike Sheil, showed up at the meeting and challenged the legitimacy of the proposal moving forward because property owners had not been properly notified. Ms Mathis and many of her neighbors wanted more specifics about how the zoning changes would affect them and the use of their property. There were also concerns that the overlay zoning district would introduce commercial zoning into areas that are now zoned residential and impose architectural review guidelines on existing property owners. Because of the challenge by Ms Mathis and Mr Sheil, the vote by Planning and Zoning was postponed until Nov 7th. In the mean time, Planning and Zoning began to notify the affected property owners by mail and a series of informational seminars were scheduled to supposedly give residents more specifics. Dee Mathis kept requesting all of the details of the proposal that would actually be voted on, but instead got mostly “vague” concepts and pretty water color sketches…. but not a lot of specifics. As you are probably aware, when dealing with Augusta government it’s always important to get the specifics in writing. The seminars were not much more informative. Critics referred to them as being more “Dog and Pony Shows” than being informative and offering specifics. It became obvious to homeowners like Dee Mathis, that the seminars, conducted by the private developer requesting the overlay zone and The Augusta Housing Authority, were mostly propaganda sessions designed to mislead residents with pretty water color sketches that had little to do with what would actually be voted on in the application. In fact, Dee Mathis and a group of allies found glaring inconsistencies, vague language, and an application that was essentially incomplete. How could an incomplete application be approved? Well, according to the law, it shouldn’t. But that didn’t stop the Planning and Zoning Department from giving their seal of approval to the Overlay Zoning District on November 7th, despite the objections raised by Ms Mathis and her allies. However, for the overlay zone to go into effect, it would need approval from Augusta Commissioners. And that is where we are today. Commissioners will take up the Overlay Zoning District at today’s 5pm BOC meeting at The Marble Palace. Inside sources are telling CityStink.net that Dist 1 Commissioner Matt Aitken (who represents the bulk of the proposed Overlay Zoning District) plans to vote in favor of the OZ. Commissioner Jerry Brigham (Dist 7) has made public statements indicating that he would likely support it as well. So will this vote fall along mostly racial lines with white commissioners voting in favor of imposing an overlay zoning district in a mostly poor , and black inner-city neighborhood at the behest of a private out-of town developer? 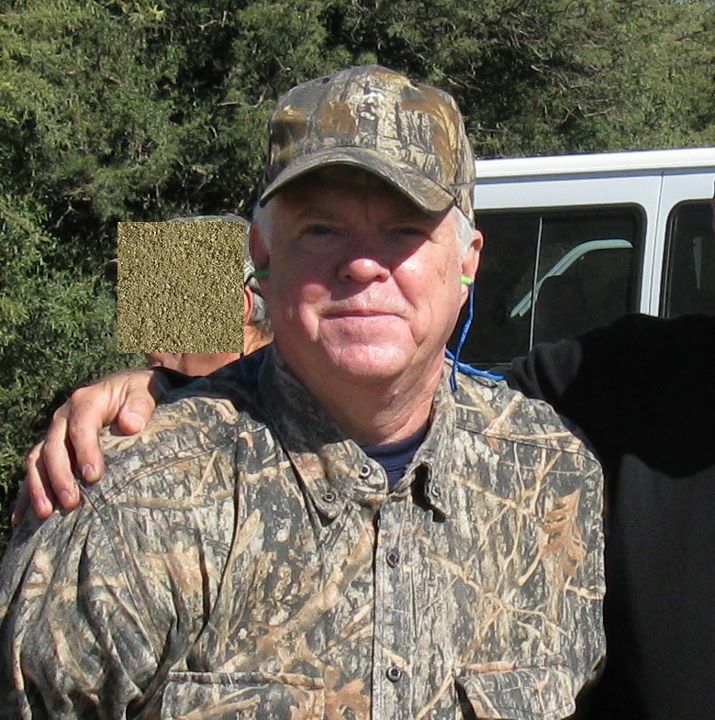 What about the “cafeteria” sometimes-leaning-libertarian Mayor Pro-tem Joe Bowles? Will he side with the property rights activists and the rule of law? Or will he fall in line and side with the private developer and approve restricting property rights and approve an incomplete application with inconsistent and vague information that would likely not withstand a legal challenge? Where do minority Commissioners Mason, Lockett, Hatney, and Johnson all stand on the Overlay Zoning District? Dee Mathis will be joined by ally and property rights advocate Al Gray at today’s commission meeting. Both are on the agenda to speak before the commissioners in opposing approval of the ordinance. Ms Mathis has also been organizing her neighbors and supporters on Facebook to pack the commission chambers today at 5pm to stop the overlay zone. Al Gray is scheduled to speak first. Mr. Gray is no stranger to these sorts of battles. He successfully challenged a similar overlay zoning district in Columbia County for the Evans Town Center area. Though not a resident of Richmond County, Mr Gray is coming out to lend his support and knowledge to Ms Mathis and the residents of Laney-Walker/Bethlehem in fighting against this proposal. For Mr Gray it boils down to the simple issue of protecting individual property rights and following the rule of law. Property rights activist and overlay zoning district veteran Al Gray has the following comment on the overlay motion coming before the Augusta Richmond County Commission Tuesday night. When these overlays came to Columbia and Lincoln Counties, they were met with public hostility to the point that there was nearly a riot at the Columbia County Planning Commission in 2000. (Reporters at the Columbia News-Times of that day can attest to this as can Columbia County Commission Chairman Ron Cross who was seen on the front row waving his fist and being decidedly loud in defense of property rights.) The overlay ordinances had to be scaled back to meet public acceptance. The Evans Town Center Overlay was thrown out in Superior Court for lack of notification, yet many Laney Walker residents had not been notified as recently as October 25. In Lincoln County, negating a corridor overlay was a key campaign issue in Chairman Wade Johnson’s victory in 2008 and the proximate cause of the firing of his Planning and Zoning Director. I suggest you all wake up. Now. Inside sources are telling CityStink.net that the commission will likely approve the overlay zoning district proposal at today’s meeting. However, commissioners could be swayed by a large turnout of residents in opposition at today’s meeting. Dee Mathis has been making the rounds of local talk radio and has been busy getting the word out. Also, the property rights and rule of law arguments made by Mathis and Gray may also have an impact on some commissioners. Most opponents believe that the ordinance, if passed in its current form, could not pass a legal challenge in the courts. **Advisory** You are encouraged to arrive early if you want a seat in the chambers. Protest signs are not permitted inside commission chambers. Opponents of the Overlay Zoning District proposal are planning to wear GREEN to show solidarity.